Waterfalls cover the Cascade Mountains. Spring and summer there a many, late summer and fall, not very many. However! In the Spring we can't get to one because of the snow blockage, and in the fall it is a wonderful stop. The Pacific Northwest Cascade Mountains feature impressive scenery with mountains, waterfalls, forest, meadows, and white-water rivers. This memorable day trip from Seattle crosses over 3 mountain passes, with a waterfall stop on Snoqualmie Pass and a waterfall stop and trail walk on Stevens Pass. If you love the trails, we will spend more time in the mountains, and shorten the lunch stop. After pickup from your hotel, B&B, the airport or pier, you'll go immediately to the foothills of the Cascade Mountains. Begin with Snoqualmie Falls, then make your way over to Leavenworth for lunch. This drive is beautiful with the evergreen trees of Douglas Fir, Western Red Cedar and Madrona, and deciduous Big Leaf Maple along with Red Alder. 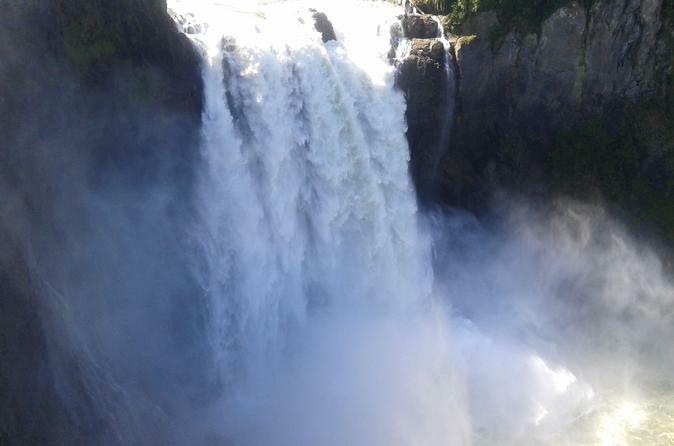 Snoqualmie Falls is fantastic, at 268 feet high and often sending a mist you can feel. You'll travel past farms and old mining towns and learn the history of our local Native people and settlers as the railroad was brought west. On Stevens Pass, you'll drive along the Wenatchee and Skykomish Rivers, and see two different waterfalls, Bridal Veil Falls and Deception Falls. Keep an eye out for the legendary Sasquatch, aka Bigfoot, on the West side of Stevens Pass! Deception Falls on Stevens Pass is also terrific. There is a trail to walk if you wish, That is worth a stop anytime, with the water roaring down the falls, then slowing in clear pools surrounded by rocks and trees.